Hei og god Onsdags formiddag♥. I dag vil jeg vise dere et bursdagskort jeg har laget. Tromsø hvor min datter Anita arbeider♥. Setter veldig stor pris på alle sammen♥. This is so pretty. I love the bricks. Thank you for joining us at Inky Impressions. Beautiful card!! Cute image, and you used so nice, warm colours! Nydeligt kort,så fine ark og oppsett.Helt herligt pynta. Superb design for this card ! So pretty ! Hei, beautiful card, lovely frame! Dette var et fint kort. Fin fargekombinasjon og flotte utstansa detaljer! 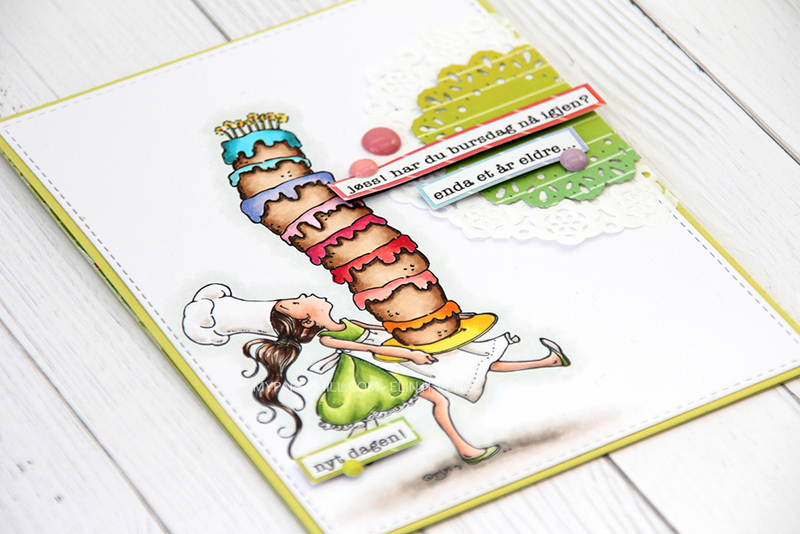 What a pretty card I love the warm colours, thanks for joining us at Inky Impressions this week, good luck!! Lovely card. Thank you for joining us at Dream Valley. Pretty card, inside & out! Thanks for joining us at Make It Monday. ooh gorgeous card! Thanks for joining us at Ooh La La Creations. What a gorgeous card, I love the ornate die cut frame, and the inside is as beautiful as out. Thanks for joining in with our Die Cuts & Punches theme.